Strength and finesse, robustness and frailty: The Tourbillon is the pinnacle of the art of watch making, to which Perrelet adds a limited and numbered edition of 20 timepieces. gaining the much-coveted COSC certificate which is rarely awarded to such complications. The automatic mechanical movement has been decorated with traditional Geneva Stripes and combines perfectly with the winding rotor which features an inlaid glass insert bearing the brand’s name. The entire mechanical marvel can be savoured by the open case back which allows an unimpeded view of the inner workings. Both worlds coexist in perfect harmony. 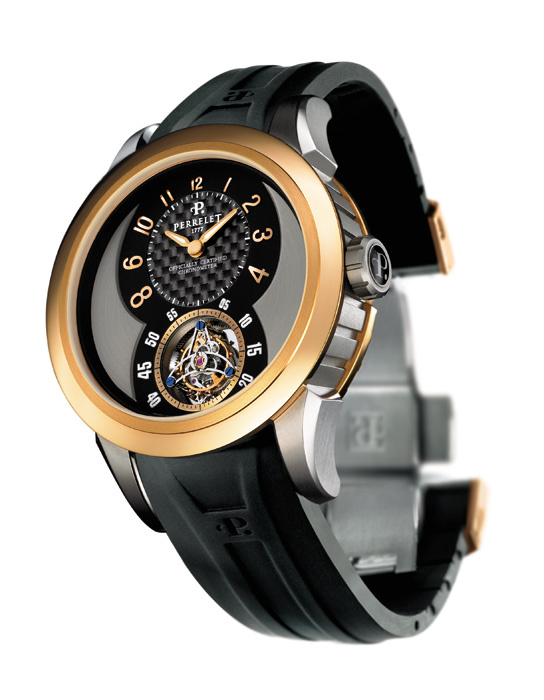 Tradition is found in the tourbillon movement and the way it has been decorated. The modern touch is emblemized by the case and in particular by its dial. On the face of the watch, matt surfaces in black are combined with a decentred carbon-fibre dial which displays hours and minutes. Vertically arranged titanium inserts lead to the marvel of the “flying” tourbillon which rotates once every minute around its own axis. A natural black rubber strap which has been embossed with the Perrelet Logo and a titanium/red gold deployment buckle compliment this watchmaking specialty. This limited Tourbillon edition is immediately available at official Perrelet retailers throughout the world.